Detroit -- The Belle Isle Aquarium was packed with people Saturday, and from the outside, it was difficult to tell that the historic building was not actually open for business. Shuttered in 2005, the aquarium has sat vacant except for the goldfish and koi brought in from an outside pond in the cold weather months. But on Saturday, boosters of Belle Isle held the annual Shiver on the River as way to highlight the island and raise awareness of the $1 million it will take to get the aquarium operational again. "We knew they still had some fish and were hopeful there would be some to see," said Josh Simms of Royal Oak as his mother, Kris Simms, took a picture of him and his 11-month-old daughter, Shaelyn, as goldfish swam in a tank behind him. "We were hopeful." 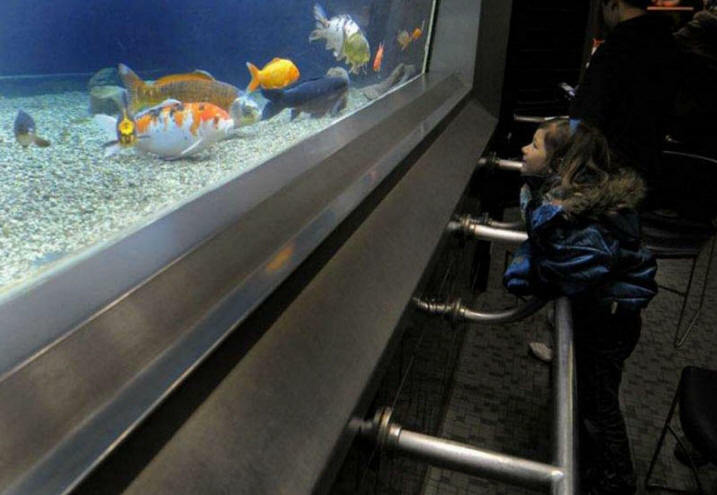 Mary Kay Kubicek brought her three children to check out the aquarium on Saturday. She said she brought the older ones several times a month to visit the aquarium when it was open and brought them the day the facility closed. "It is a great place," Kubicek of Dearborn said as her husband, Daniel Kirk, spent Saturday helping out at the aquarium directing visitors. For information about the aquarium, visit www.belleisleaquarium.com. *(Web master's note) It is a common and understandable error, but the tiles are not Pewabic.